After viewing the blogs of others, I have been inspired to include a weekly update of blog-related activities. While this may be helpful for others, I hope that it will keep me motivated to continually writing regularly. category of writing (blog post, journal, e-book, devotional). From these four data fields I can easily calculate a variety of measurements and create the chart below. Another long-term project that I have been working on since 2014 is writing out by hand the entire Bible. I started with Genesis and completed several Old Testament books before switching to the New Testament. I am currently back in Joshua. 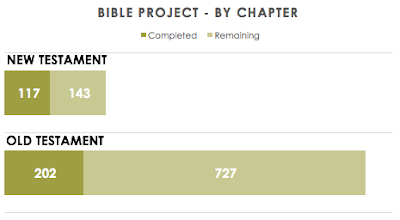 The chart below compares the Old and New Testaments by chapters completed. Looking at this, I feel a little overwhelmed by how much is left. However, several book have short chapters, so it may not be as challenging as it could be. For both of these writing projects, the key is consistency of regular daily effort. In September, 2015, I wrote about this idea in a post titled, "The start of every journey." While the Bible project has been ongoing for several months, the Writing 365 project is new for 2016. However, it has reminded more than ever of how important it is to work incrementally but regularly towards goals. What goals have you set for 2016? How are you doing two weeks in to the new year?